Foley is pleased to present the first New York solo exhibition of photographer Ilona Szwarc. Ilona Szwarc’s “American Girls,” is a classically stylized portraiture series identifying varied juvenile personalities across our country. 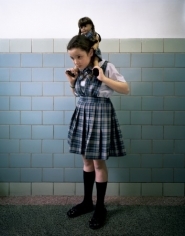 Young girls are accompanied by a customized version of themselves, a modern “American Girl” doll shown helping them along in their early growth. The dynamics of the series’ content guides the viewer into the guileless aesthetics of childhood. In response to her subjects, Szwarc posits an utterance of unrest in her imagery. These pictures reveal that the American Girl doll can also give an illusion of choice, a catalyst for fantasies of distinction. Each doll can be customized and treated to look exactly like its owner, yet all of them have the same origins and beneath their costume they bear the same form. The relationship between the girls and their dolls embellish privileges of first-world childhood while addressing problems in euro-centric gender ideology. The feminist values inherent to Szwarc’s work draw from the source of what contributes to shaping a young woman’s virtues while celebrating the history of being a young lady growing up today, and the performativity American culture encourages. Dolls supplement girlhood through fun, enchanting play, where the power of youth and the inimitable innocence is affirmed as totally unique. Szwarc captures the desire for individuality and the liberating influence having a doll so similar to oneself can have for a young girls imagination and ultimately her world-view. Ilona Szwarc is an award-winning photographer, who lives and works in New York City. She was born and raised in Warsaw, Poland. Szwarc has had a solo exhibition at Claude Samuel gallery in Paris and Maison de la Photographie in Lille, France. Her work has been featured in numerous publications worldwide including The New York Times Magazine, TIME, The New Yorker and The UK Sunday Times Magazine. Her project “American Girls” has received worldwide recognition, having been highlighted in The New York Times Lens Blog, MSNBC Today.com and The Huffington Post, among others.